Dr Vahan Ter-Ghevondian, Director of the Matenadaran, Ms Lilit Makunts, Minister of Culture of the Republic of Armenia, Mr Ashot Hovakimyan, Deputy Minister of Foreign Affairs of the Republic of Armenia, Dr Cristina Menegazzi, UNESCO Project Officer of the “Emergency Safeguarding of the Syrian Cultural Heritage”, Mr Hoa-Binh Adjemian, Head of Cooperation Section of the EU delegation to Armenia, and H.E. Mohammad Ahmad Haj Ibrahim, Ambassador Extraordinary and Plenipotentiary of the Syrian Arab Republic to the Republic of Armenia welcomed the participants. 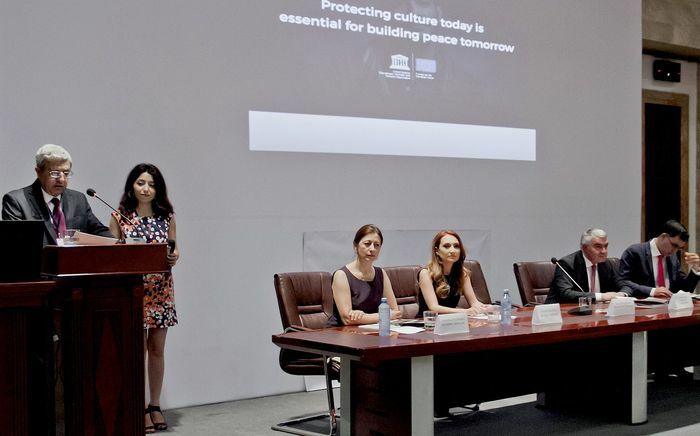 Theoretical and practical modules led by the Restorers of the Matenadaran and headed by Dr Gayane Eliazyan, Head of the Restoration Department followed the opening ceremony. The Training is co-organized by the Matenadaran and Mashtots Foundations, Armenian National Commission for UNESCO in the framework of the “Emergency Safeguarding of the Syrian Cultural Heritage” UNESCO project financed by the European Union and supported by the Governments of Austria and Flanders. The Training ends on 27 June, 2018.